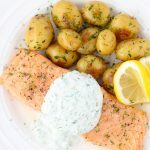 Juicy, roasted salmon is so tender and the creamy yogurt sauce, packed with the flavors of dill, chives, garlic and lemon, is perfect to serve alongside. Make the yogurt sauce in advance and store in the refrigerator or prepare it while the fish is in the oven. Mix the yogurt, lemon juice, dill and chives. For the garlic, I like to smash it lightly and add it to the sauce and then remove it before serving. This will give a mild garlic flavor to the sauce, but won’t be too overpowering. You can also mince the garlic, or grate it on a microplane, if you want to have a stronger garlic flavor. Season with salt and ground black pepper to taste. Minced capers are a great addition to this sauce too. Preheat the oven to 500 degrees Fahrenheit. Place a rimmed baking sheet into the oven to heat up. Meanwhile, season each salmon fillet with salt and pepper and rub each fillet with oil all over. Place the fish in the preheated oven. Reduce the heat to 250 degrees and roast the fish for 12 – 15 minutes. Serve the salmon with the yogurt sauce.